It’s been a while since we last updates as we should have due to irregularities of fiscals. Meanwhile, thanks goes to all our readers whom has not lost faith in us. Special thanks to our own Afro Pop Artist Gidnick, whom has taken time to constructively criticize not just the Nigerian public office holders, but everyone whom has remained irregular. Starring Mr Lush and Obaino 2, Gidinick in this track fingered the trending tragic issue of the Heeds-men, The Rat that has dominated Aso Rock and other mysterious animals that now swallow public funds. Not with standing the dramatic sensation of Obaino 2 and Mr Lush, we can tell that the Nigerian youth are pretty much awake and ready for 2019 election. Our attention was drawn to this track a social trend as the political sector is now been floored by younger participants. However, we are yet to receive formal notes or words concerning the political interest of this youths. We hope that our stars remain regular with this trend too. 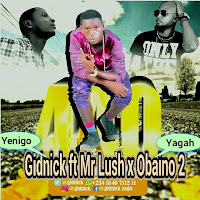 Click Here to Download 440 by Gidnick ft Mr Lush & Obaino 2.